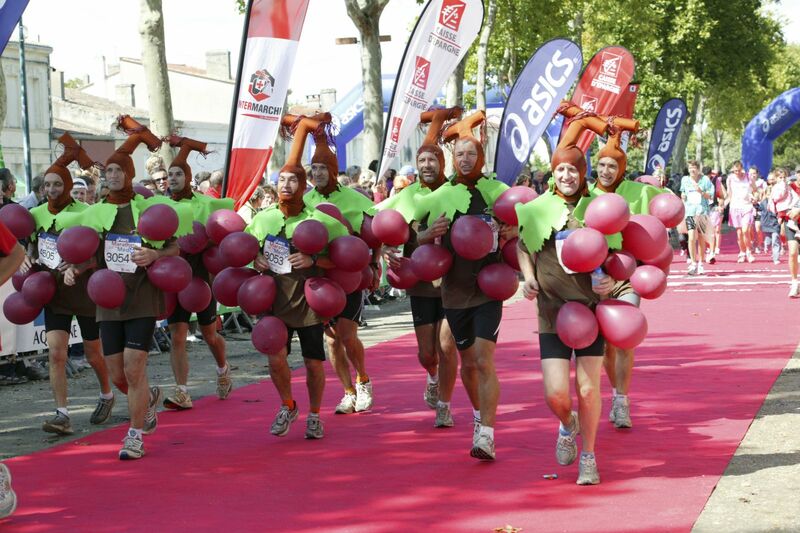 Though the thought of running just over 26 miles may already be giving you the sweats, the people of Bordeaux have found a way to make the distance bearable. The race takes you through the region’s most beautiful vineyards and châteaux (in total there are around 50 châteaux along the way), so if you need a little break, the views are a perfect excuse to take a quick time-out. If you get too hot, some marathon-racers like to take a dip in the châteaux’s surrounding lakes, which is probably the only time it’s acceptable to do such a thing, so make sure you seize the opportunity if you can! You can also forget your marathon running playlist as the route is dotted with musicians, so many in fact that there’s one or more per kilometre, playing all types of different songs - what better encouragement could you want? Well, there is one thing that might top live music... copious amounts of wine and food! This race isn’t about speed and getting the best time; it’s about having the best time, and the French certainly know how to enjoy themselves, especially in the South. The night before the event, the marathon organisers hold pasta parties for the 10 000 (or so) attendees to feast on carbs and booze before the big day. On the day itself, the party continues: a sumptuous menu of oysters, foie gras, cheese, steak, ice-cream, sweets, cheese, bread, crackers and more await you along the route. Naturally, these marathon snacks are accompanied by the ultimate - ahem - ‘performance-enhancing’ beverage: water wine. From red, to whites, to rosé, each stand has different wines to pair with the food that’s being served. 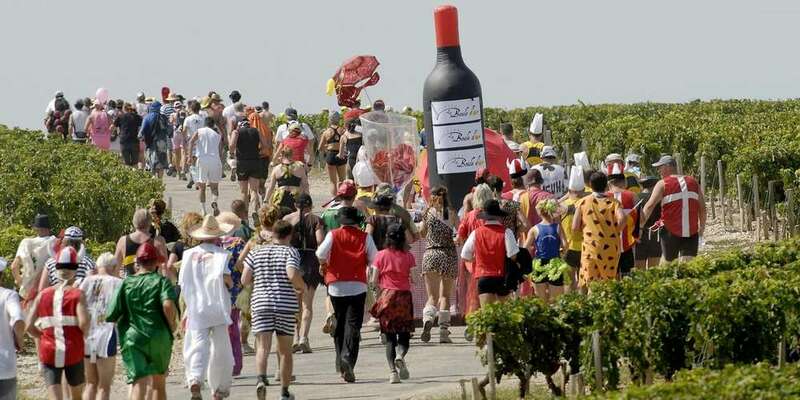 To give you an idea about how much wine is present at this marathon, the average runner is expected to drink 23 glasses en-route - that’s a whopping 230 000 glasses of wine (give or take) served in one day! If you complete the race in less than 6 and a half hours, you also get a goodie bag with engraved wine glasses, a bottle of wine and a medal. Beats the usual t-shirt and Granola bar you usually find at other marathons, if you ask us. You’ve probably understood by now that this marathon is by no means ultra-competitive, well, not in the sense that goal is to get the best time. In this event, it’s all about who’s got the best fancy dress outfit or home-made chariot. From giant Rubiks cubes pulled along in makeshift wheelbarrows to small viking boats carried by determined teams of runners, the award for best chariot is multiple bottles of Grand Cru wines. Better than a flimsy plastic trophy right? If you want to participate this year’s race, you can find all the information you need here (spoiler alert, this year’s theme is ‘Amusement Park’). As The Wine Show’s official travel partners, we’re delighted to offer you specialised, hand picked tours and locations inspired by all the destinations visited throughout the duration of the series, check them out here!